The 1980s was a decade of spandex, mullets, big guitar solos and big hair. It was a great time to be alive ! I was a child at the time, but a few things stick in my mind from this era; my beloved Montreal Canadiens won the Stanley Cup in 1986, the Edmonton Oilers dynasty was rocked by the Gretzky trade of 1988 and popular music was dominated by big, flashy, arena rock anthems. The music is what I remember most from the 1980s. In case you don't know, I'm a musician. Sort of. A guitar player and sometimes a singer. The 1980s rock scene was dominated by tenor voices such as Axl Rose's angry screeching, David Lee Roth's scatting and beebopping with Van Halen, and Steve Perry's saccharine vocal hooks with Journey. While I'm clearly a baritone, I admit that I belt out my fair share of 1980s hair rock in the car, when no one else is around. And Steve Perry's vocal stylings always had the strongest pop sensibilities. Those high, reaching vocal runs are a fist-shaking good time. I dare you to listen to "Oh Sherrie" and NOT sing along. Go on, try it. I'll wait. Glendronach is a Highland distillery located near Forgue and draws its water from the Dronach Burn. It was founded in 1826 by James Allardice and was bought only four years later by Walter Scott. Over the years, the Glendronach distillery has changed hands as often as the Cleveland/Los Angeles/St. Louis/Los Angeles Rams. After Walter Scott, Glendronach has belonged to Captain Charles Grant (son of William Grant, founder of Glenfiddich), William Teacher and Sons, Allied Distillers, Pernod Ricard and Chivas Brothers, and finally by the BenRiach Distillery Company. Glendronach's 12 year old expression is matured in a combination of Pedro Ximenez and Oloroso sherry casks for the entirety of its maturation. This malt is what you might call a "sherry bomb". While sherry bomb scotches are not as controversial as E150A caramel colouring or chill-filtration (neither of which are used in this whisky, F.Y.I. ), some malt-heads don't really like to admit that they like them. My favourite malts are peated, smoky, spicy scotches from Islay, like Lagavulin, Laphroaig, and Caol Ila. Perhaps it's silly machismo on my part, but I'm always a bit cautious about admitting I like sweeter, fruity scotches. But I'm nothing if not honest. I should note that the bottle I'm reviewing was not mine. My wife's grandfather is very generous and I have shared this particular bottle on several occasions with him dating back to December 2016. You should note: the last third of the bottle was much fruitier than the first two thirds. Some of the vanilla and toffee is toned down as the scotch is exposed to the air. I've never added water to this whisky. It's bottled at 43% ABV, so it isn't that strong. It's also very fruity, but not too sweet, ergo I did not feel the need to dilute it in order to tone down any flavours. I also thoroughly enjoyed the rich mouthfeel, and adding water would likely take away more than it contributed. Scotch is best enjoyed with company. It's a drink to linger over and savour, it's not one you rush. This dram is a perfect after-dinner sipper. It's sweet enough to take the place of dessert. I'm not much for "fruity" drinks, but it's hard to find fault with this whisky. It's not the most complex malt, residing firmly in the "fruity" category, but it doesn't claim to be anything else. 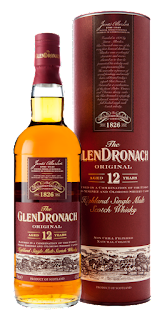 Glendronach 12 Year Old is a good choice for those who have only tried Glenfiddich's 12 in the single malt category. Glendronach won't break the bank, and there's very little chance you'll dislike it. Peated scotches (my favourites) are like the band Rush (also one of my favourites); they tend to polarize people into "love them" or "can't stand them". Sherried scotches are more like Journey; they may or may not be your favourite, you may or may not admit that you like them, but you'll sing along when you hear them. Or in the case of Glendronach 12, you'll certainly accept a wee dram when it's offered. I love classical music, but I can't even look at the word "Sherry(or Sherrie)" without hearing this song. But then, I was only a wee lad in the 80s (born in 79) and these things kind of stick with me.